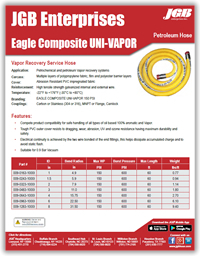 Eagle Composite UNI-VAPOR Hose - JGB Private Brand - Hose by Vendor - JGB Enterprises, Inc.
High tensile strength galvanized internal and external wire. Complete product compatibility for safe handling of all types of oil based 100% aromatic and vapor. Tough PVC outer cover resists to dragging, wear, abrasion, UV and ozone resistance having maximum durability and safety. Electrical continuity is achieved by the two wire bonded of the end fittings, this helps dissipate accumulated charge and to avoid static flash.